My goal as a personal trainer is to accomplish the balance between fitness and lifestyle that makes achieving your goals sustainable. I have experience in fat loss, muscle gain and endurance event preparation for both running and cycling. I use a range of training styles to get you to your goals, whilst adding fun to each session. Love working out with like-minded people? I run community classes to bring people together who share a passion for fitness, fun & sweat! Plus, group exercise is proven to help you stick to your fitness goals. I run classes throughout the year and all dates will be published below with a link to book online. Energise and motivate your employees with a workplace workout or longer-term fitness programme to achieve health goals and help to reduce stress. 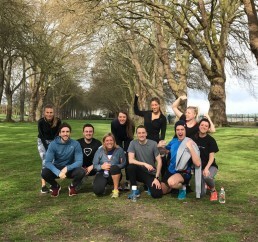 Group exercise brings employees together with a sense of community, improves morale and has been linked to increased productivity. If you would like to join one of the classes I deliver each week from London studios, KXU Chelsea & One LDN Imperial Wharf, my timetable is below and classes can be booked through each studio website. I teach Spin, HIIT & TRX classes and I can guarantee a fun workout with LED lights, pumping music & sweaty sets!